Nancy Pelosi holds the speaker's gavel after being elected speaker as the U.S. House of Representatives meets for the start of the 116th Congress inside the House Chamber on Capitol Hill in Washington, Jan. 3, 2019. Nancy Pelosi swore the oath securing her status as the most powerful woman in U.S. political history Thursday, beginning a new era of divided government in the United States and setting up a formidable political rivalry with President Donald Trump. Pelosi's historic second turn leading a Democratic majority as the speaker of the U.S. House of Representatives marks only the second time in the last half century a speaker has returned to serve in that position. Pelosi's continued ability to navigate the challenges of being a woman in politics — and still the only female House speaker — will inform her approach as she turns to the immediate crisis of ending a partial government shutdown. House Democrats passed a package of six spending bills that would end the partial government shutdown by fully funding most of the impacted government agencies through Sept. 30. A separate bill funding the Department of Homeland Security — the agency that would oversee money for a U.S.-Mexico border wall — would be funded through Feb. 8. ​But the U.S. Senate is unlikely to pass the House proposal, placing Pelosi in a difficult position early in her speakership. She has been adamant she will not provide Trump's requested $5.6 billion in funding for a wall the president insists is necessary to secure the southern border and prevent the flow of undocumented immigrants into the United States. "The President is using the government shutdown to try to force an expensive and ineffective wall upon the American people," she said in a statement earlier this week. But the president said Democrats are playing politics with the battle over border security. The government shutdown debate marks the first time Trump has faced an opposition party in power, following two years of complete Republican control of government. Debbie Walsh, director of the Center for American Women and Politics, said the televised Oval Office meeting between Trump, Pelosi and Senate Minority Leader Chuck Schumer last month debating border security funding provided a preview of how the new House speaker will interact with the president. 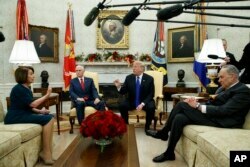 FILE - House Minority Leader Rep. Nancy Pelosi, D-Calif., Vice President Mike Pence, President Donald Trump, and Senate Minority Leader Chuck Schumer, D-N.Y., argue during a meeting in the Oval Office of the White House, Dec. 11, 2018. Trump said Pelosi was not in a position to negotiate on border security because of her need to secure the upcoming vote for House speaker. She replied, "Mr. President, please don't characterize the strength that I bring to this meeting as the leader of the House Democrats, who just won a big victory." Walsh said Pelosi's approach "openly challenged" the president but did so in such a way that was "strong, clear and civil." Pelosi secured the votes needed to win the speakership shortly afterward, but she continues to face a challenge from some members of her party who want to see Democrats take a more progressive approach. The new House speaker has also been careful to tamp down discussions of impeaching Trump while supporting House committee investigations that plan to oversee the president's business activities and contacts with Russia during the 2016 presidential campaign. But in an interview with NBC Thursday, Pelosi said, "We shouldn't be impeaching for a political reason, and we shouldn't avoid impeachment for a political reason." Pelosi faces a delicate balancing act in the coming months, a challenge Walsh says she is well-prepared to face because of her previous turn as House speaker. "She comes to the table with tremendous experience," Walsh said. "I think in many ways, she has been acknowledged as one of the greats, one of the most successful speakers we have seen." Walsh cites Pelosi's work uniting her caucus in 2010 to pass the Affordable Care Act, one of President Barack Obama's signature legislative achievements. Pelosi has also faced numerous political challenges from the Republican Party, which often singles her out as the extreme liberal face of the Democratic Party. Pelosi is familiar with the challenges of political life. Her father was a Democratic congressman and a mayor of Baltimore, but Pelosi didn't go into politics until later in life, after having children. "I am particularly proud to be the woman speaker of the House of this Congress, which marks 100 years of women having the right to vote," Pelosi said in remarks upon assuming the position of speaker of the House. 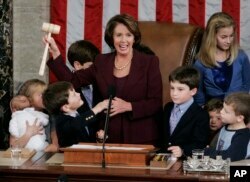 FILE - Newly elected Speaker of the House Nancy Pelosi, holds up the gavel surrounded by children and grandchildren of members of Congress in the U.S. Capitol in Washington, Jan. 4, 2007. Pelosi will lead a Congress with a record number of female representatives, while facing a president who has been criticized for his treatment of women. The accusations of sexual assault levied against Trump, his administration's policies on reproductive rights and his appointment of Supreme Court Justice Brett Kavanaugh, who was also accused of sexual assault, has sparked protests across the country. Pelosi's appointment as speaker places her in the high-profile position of being the most powerful woman in the country to oppose him. The new House speaker has never shied away from highlighting women's issues. She marked her first time in the speaker's chair in 2007, surrounded by her grandchildren and the children of members of Congress. "She does talk about gender. She doesn't say it's been very hard for me because I'm a woman, but she talks about the difference women make when they're in office, why it's important to have them there. And she has a tremendous gender consciousness around policy issues," Walsh said. But this time, her assumption of the speaker's chair will be different. As part of the deal to secure the votes for her nomination as speaker, the 78-year-old Pelosi agreed to a term limits deal that would cap her time in the nation's third-ranking political position at four years. "Nancy Pelosi is one tough cookie wrapped in a package that looks like a nice lady," Walsh said. "Very poised, very gracious, with a spine of steel. And if you underestimate her — you do so at your own peril."